Corporal Daniel Palmer (USMC ret.) proudly served with the 3rd Battalion, 6th Marine Regiment. In 2010, while on patrol in Marjah, Afghanistan, his life changed forever when Cpl. Palmer stepped on an Improvised Explosive Device (IED). 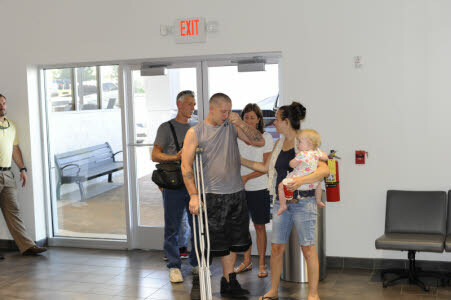 As a result of the blast, he lost his right leg and sustained other life-altering injuries. 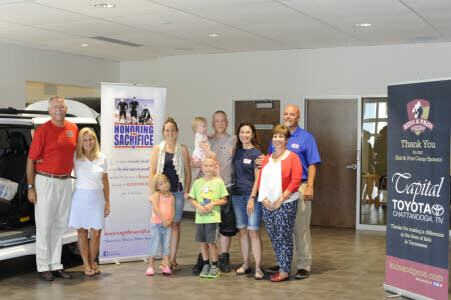 Chattanooga-based Honoring the Sacrifice Foundation surprised the Palmer family when they presented him with a gently-used 2013 Toyota Sienna. According to Honoring the Sacrifice Board President Todd Smith, “this van will provide much needed, safe and reliable transportation for Cpl. Palmer, his wife, and their three young children.” The presentation took place at Capital Toyota on Lee Highway in Chattanooga. 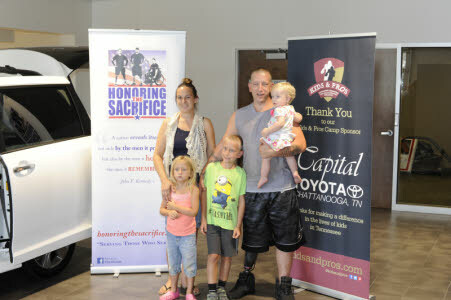 The Capital Toyota staff was in on the surprise, and joined Honoring the Sacrifice in revealing the secret to an overwhelmed Palmer family. To learn more about the Honoring the Sacrifice Foundation, go to its web site atwww.honoringthesacrifice.org.